Our inventory currently contains 1043 matches against your search criteria. white pages NM-/NM $30 Make An Offer! white pages, copy B NM-/NM $30 Make An Offer! white pages, copy C NM-/NM $30 Make An Offer! White pages CGC 9.8 NM/M $450 Make An Offer! White pages CGC 9.8 NM/M $400 Make An Offer! White pages CGC 9.8 NM/M $250 Make An Offer! White pages CBCS 9.6 NM+ $100 Make An Offer! White pages, foxing back cover VF $25 Make An Offer! White pages CGC 9.8 NM/M $150 Make An Offer! White pages CBCS 9.6 NM+ $80 Make An Offer! Offwhite/white pages NM/NM+ $60 Make An Offer! White pages, sweet copy VF/NM $15 Make An Offer! White pages, Mr. Sinister and the nasty boys cover NM- $5 Make An Offer! White pages, sealed NM+ $20 Make An Offer! White pages, Limited edition signed by Rob Liefield NM $20 Make An Offer! White pages, Cable trading card NM $10 Make An Offer! White pages, Limited edition signed by Rob Liefield NM-/NM $20 Make An Offer! White pages CGC 7.5 VF- $20 Make An Offer! White pages, comes with deadpool card F $8 Make An Offer! White pages F $8 Make An Offer! White pages CGC 9.8 NM/M $125 Make An Offer! White pages NM+ $50 Make An Offer! QUALIFIED - 2/3 of page 4 missing, affects story, incomplete, Offwhite pages CGC 4.0 VG $3,500 Make An Offer! Offwhite pages, small S written on front cover CGC 9.0 VF/NM $1,350 Make An Offer! Offwhite/white pages CGC 9.4 NM $2,500 Make An Offer! Offwhite pages, Light transfer stain front/back covers, nice copy VF/NM $1,100 Make An Offer! PERFECTLY CENTERED! Offwhite/white pages CGC 9.4 NM $3,600 Make An Offer! Offwhite/white pages CBCS 9.4 NM $2,500 Make An Offer! Offwhite/white pages CGC 9.0 VF/NM $800 Make An Offer! Offwhite/white pages VF-/VF $260 Make An Offer! Offwhite pages VG+ $80 Make An Offer! Cream/offwhite pages VF $135 Make An Offer! Offwhite pages, centerfold detached from top staple VG+ $42 Make An Offer! Offwhite pages, heavy tanning inside front/back cover F+ $65 Make An Offer! Offwhite pages, DEC 7 stamped on back cover F/F+ $65 Make An Offer! Offwhite pages, small 12/29 written on front cover in pen, distributor spray along top VF/NM $450 Make An Offer! Offwhite pages, subscription crease VG+ $42 Make An Offer! Offwhite/white pages CGC 9.2 NM- $475 Make An Offer! Old Label White Page beauty CGC 9.2 NM- $450 Make An Offer! Offwhite/White pages CGC 9.0 VF/NM $350 Make An Offer! Offwhite/white pages CBCS 9.0 VF/NM $350 Make An Offer! Offwhite/white pages F- $55 Make An Offer! Offwhite/white pages F- $42 Make An Offer! Cream/offwhite pages NM- $250 Make An Offer! Cream/Offwhite pages CGC 8.5 VF+ $135 Make An Offer! White pages CBCS 9.0 VF/NM $225 Make An Offer! Offwhite/white pages F/VF $65 Make An Offer! Offwhite pages, two pages have tears VG+ $35 Make An Offer! Offwhite/white pages, really nice copy CGC 9.0 VF/NM $325 Make An Offer! Offwhite/white pages F+ $48 Make An Offer! White pages, subscription crease VG/F $35 Make An Offer! Offwhite/White pages NM- $350 Make An Offer! Cream/Offwhite pages VG+ $40 Make An Offer! Offwhite/white pages VF/VF+ $135 Make An Offer! Offwhite/white pages, SEP 15 stamped on back cover VF- $75 Make An Offer! Offwhite/white pages VG/F $32 Make An Offer! Offwhite pages CGC 9.0 VF/NM $300 Make An Offer! Cream/offwhite pages CGC 9.0 VF/NM $200 Make An Offer! Offwhite/white pages, Tiny R r written on front cover in pen VF/NM $175 Make An Offer! Offwhite/white pages, OCT 13 stamped on top of back cover F/VF $65 Make An Offer! Offwhite pages F/VF $160 Make An Offer! offwhite pages CGC 8.5 VF+ $155 Make An Offer! Offwhite/white pages, DEC 12 stamped on top of back cover VF $90 Make An Offer! Cream/Offwhite pages F+ $45 Make An Offer! Offwhite/white pages CBCS 9.4 NM $375 Make An Offer! Offwhite/white pages, JAN 16 stamped on top of back cover VF- $75 Make An Offer! Offwhite/white pages, name written on splash page F+ $45 Make An Offer! Offwhite pages, FEB 21 stamped on front cover CGC 9.2 NM- $250 Make An Offer! Offwhite/white pages CGC 9.0 VF/NM $265 Make An Offer! Offwhite/white pages, FEB 9 stamped on top of back cover F/VF $50 Make An Offer! Offwhite/white pages CBCS 9.4 NM $285 Make An Offer! Offwhite/white pages, small C written on front cover in pen NM- $265 Make An Offer! Offwhite/white pages, tiny 4/4 written on front cover in pencil VF/NM $190 Make An Offer! Offwhite/White pages, MAR 23 1967 stamped on back cover, being reholdered PGX 9.0 VF/NM $175 Make An Offer! Offwhite/white pages, small stains bottom back cover VF $75 Make An Offer! Offwhite/white pages, APR 24 stamped on top of back cover VF $70 Make An Offer! Offwhite/white pages F+ $42 Make An Offer! Offwhite/white pages, MAY 16 stamped on top of front cover VF- $65 Make An Offer! Cream/offwhite pages CGC 6.5 F+ $160 Make An Offer! Offwhite/white pages, AUG 24 1967 stamped on top of front cover VF $70 Make An Offer! Offwhite/White pages VF/NM $250 Make An Offer! Offwhite/white pages CGC 7.5 VF- $70 Make An Offer! JAN 18 1968 neatly stamped on front cover, offwhite pages VF/NM $165 Make An Offer! Offwhite pages CGC 8.5 VF+ $120 Make An Offer! Offwhite pages CGC 8.5 VF+ $110 Make An Offer! Offwhite pages CGC 9.4 NM $450 Make An Offer! Offwhite pages NM- $250 Make An Offer! White pages CBCS 9.0 VF/NM $185 Make An Offer! Cream/offwhite pages F $30 Make An Offer! Cream/offwhite pages VG+ $25 Make An Offer! Cream/offwhite pages CGC 9.2 NM- $210 Make An Offer! Tear on Back cover, return to Ted NM- $135 Make An Offer! Offwhite/white pages, MAY 7 REC CGC 9.0 VF/NM $165 Make An Offer! Offwhite pages, small S written on back cover F+ $36 Make An Offer! Offwhite pages VG/F $25 Make An Offer! Offwhite/White pages, cover detached from bottom staple VG+ $25 Make An Offer! Offwhite/white pages VF $75 Make An Offer! Offwhite pages, small S written on back cover VG/F $25 Make An Offer! Offwhite pages CGC 9.0 VF/NM $165 Make An Offer! Offwhite/white pages CGC 9.2 NM- $350 Make An Offer! Offwhite/white pages, staining along bottom of book, structurely nice F/VF $60 Make An Offer! Offwhite/white pages CGC 9.2 NM- $265 Make An Offer! Offwhite/white pages VF/NM $220 Make An Offer! Offwhite/White pages VG/F $25 Make An Offer! Offwhite/white pages VF/NM $185 Make An Offer! Offwhite/White pages CGC 9.0 VF/NM $185 Make An Offer! White pages CBCS 9.0 VF/NM $175 Make An Offer! Cream/offwhite pages, 11/4 written on top of back cover in pencil VF+ $120 Make An Offer! Offwhite/white pages, gorgeous book with DEC 5 1965 stamped on front cover CGC 9.2 NM- $350 Make An Offer! White pages CGC 8.0 VF $135 Make An Offer! Offwhite/white pages, date stamp front cover VF $75 Make An Offer! Offwhite/white pages CGC 9.4 NM $300 Make An Offer! Offwhite pages CGC 9.0 VF/NM $185 Make An Offer! Cream/offwhite pages, small C written on front cover in grease pencil G+ $15 Make An Offer! Offwhite/white pages VF/NM $215 Make An Offer! White pages, subscription crease VG+ $25 Make An Offer! Cream/offwhite pages, Small C written on front cover in grease pencil, complete, well read Fr $8 Make An Offer! Offwhite/white pages, MAR 21 stamped on front cover VF/NM $240 Make An Offer! White pages CGC 8.5 VF+ $155 Make An Offer! Offwhite pages VF- $50 Make An Offer! Offwhite/white pages VF/NM $240 Make An Offer! Offwhite/white pages, very nice 9.0 CGC 9.0 VF/NM $225 Make An Offer! Offwhite/white pages, tiny 25 written on back cover in light pencil VF/NM $200 Make An Offer! Offwhite pages F/VF $55 Make An Offer! White pages, subscription crease VG+ $28 Make An Offer! Offwhite pages, small C written on front cover in grease pencil F $35 Make An Offer! White pages, subscription crease VG $22 Make An Offer! Offwhite/white pages CGC 9.2 NM- $285 Make An Offer! White pages CGC 9.2 NM- $280 Make An Offer! Offwhite/white pages, tiny tear bottom staple VF/NM $175 Make An Offer! White pages CBCS 8.5 VF+ $125 Make An Offer! offwhite pages VF+ $100 Make An Offer! Offwhite/white pages, staining back cover F/VF $55 Make An Offer! Offwhite/white pages F $34 Make An Offer! White pages, subscription crease VG/F $28 Make An Offer! Offwhite pages, small C written on front cover in grease pencil VG+ $28 Make An Offer! Cream/offwhite pages CGC 9.0 VF/NM $240 Make An Offer! Offwhite/white pages VF+ $155 Make An Offer! Offwhite pages, tiny 10 written on top of front cover in pen VF+ $95 Make An Offer! Offwhite pages, small C written on front cover in grease pencil G+ $16 Make An Offer! White pages CGC 9.4 NM $550 Make An Offer! Offwhite pages VF/NM $240 Make An Offer! Offwhite/White pages, OCT 16 1969 stamped on back cover CGC 9.0 VF/NM $175 Make An Offer! 2nd printing, White pages VF/NM $10 Make An Offer! Offwhite pages F $34 Make An Offer! Savannah $475 Make An Offer! Offwhite/white pages, distributor ink top of book VF/NM $240 Make An Offer! White pages CBCS 9.0 VF/NM $240 Make An Offer! White pages CGC 9.0 VF/NM $250 Make An Offer! Offwhite pages, writing on back cover VG- $20 Make An Offer! Mile High II $120 Make An Offer! Mile High II $175 Make An Offer! Offwhite pages, MAR 23 1971 stamped on front cover VF/NM $150 Make An Offer! Offwhite/white pages F $40 Make An Offer! Offwhite pages, water stain VG+ $20 Make An Offer! Offwhite pages, distributor spray on spine, bottom of book, right edge G+ $10 Make An Offer! offwhite pages VF/NM $110 Make An Offer! Offwhite pages, 40 written on front cover in red pen VF- $40 Make An Offer! Offwhite pages, water staining G+ $10 Make An Offer! Offwhite pages, 1.5' piece of tape on spine G $7 Make An Offer! Offwhite/white pages CGC 9.4 NM $285 Make An Offer! Offwhite pages, picture frame marvel VG+ $18 Make An Offer! Offwhite pages, piece cut out of one page, affects story Pr $4 Make An Offer! Offwhite/white pages CGC 9.2 NM- $185 Make An Offer! Offwhite pages, picture frame marvel F $21 Make An Offer! Offwhite pages, rich colors, picture frame marvel VG $14 Make An Offer! Offwhite/white pages, glossy VF+ $70 Make An Offer! Offwhite/white pages NM- $265 Make An Offer! Offwhite/white pages, light foxing bottom front cover VF/NM $140 Make An Offer! Offwhite/white pages NM-/NM $200 Make An Offer! Mile High II $140 Make An Offer! Cream/offwhite pages, tiny chip out of bottom of back cover F/VF $40 Make An Offer! White pages CGC 9.6 NM+ $475 Make An Offer! White Pages CGC 9.4 NM $2,600 Make An Offer! White Pages with Perfect Centering CBCS 9.4 NM $2,495 Make An Offer! Offwhite pages, Color touched on spine NM- $675 Make An Offer! Offwhite/white pages NM-/NM $500 Make An Offer! Offwhite/white pages NM- $400 Make An Offer! White pages CGC 9.4 NM $385 Make An Offer! Offwhite/white pages, tiny p written on bottom of back cover in pen VF/NM $200 Make An Offer! Offwhite pages VF/VF+ $110 Make An Offer! Offwhite pages, 4 inch bottom spine split, cover detached from bottom staple Fr/G $8 Make An Offer! White pages CGC 9.6 NM+ $500 Make An Offer! White pages CBCS 9.2 NM- $175 Make An Offer! 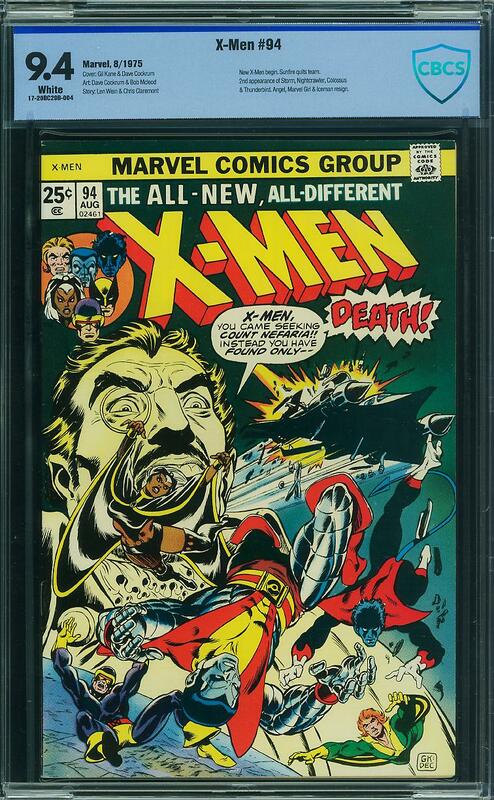 Qualified, Offwhite/white pages, cover detached from top staple CGC 8.5 VF+ $150 Make An Offer! Offwhite pages VF/NM $210 Make An Offer! Offwhite pages VF/NM $185 Make An Offer! White pages, really nice copy CGC 9.4 NM $1,200 Make An Offer! Offwhite/white pages CGC 9.4 NM $1,150 Make An Offer! Offwhite/white pages CGC 9.6 NM+ $350 Make An Offer! Offwhite pages, 1/8' light upper front corner cover VF+ $90 Make An Offer! Offwhite/White pages CGC 9.2 NM- $145 Make An Offer! offwhite to white pages CGC 9.0 VF/NM $75 Make An Offer! Offwhite/white pages VF- $40 Make An Offer! Offwhite/white pages, from the Dallas Stephens collection CGC 9.4 NM $120 Make An Offer! Offwhite/white pages CGC 9.4 NM $115 Make An Offer! Offwhite/white pages VF $48 Make An Offer! Offwhite/white pages G+ $20 Make An Offer! White pages CBCS 9.6 NM+ $225 Make An Offer! Offwhite pages NM- $125 Make An Offer! offwhite to white pages CGC 9.2 NM- $125 Make An Offer! Qualified, White pages, cover detached from bottom staple CGC 9.6 NM+ $50 Make An Offer! tiny 75 written in pencil on back cover, offwhite/white pages CGC 9.4 NM $150 Make An Offer! White pages CGC 9.4 NM $150 Make An Offer! Offwhite pages CGC 9.4 NM $140 Make An Offer! offwhite pages, tiny 3.00 written on bc in pencil NM- $110 Make An Offer! White pages CGC 9.4 NM $140 Make An Offer! Offwhite/white pages, distributor spray along top of book NM- $110 Make An Offer! Offwhite/white pages VG+ $15 Make An Offer! Offwhite pages, centerfold detached from bottom staple G $6 Make An Offer! Offwhite pages NM $115 Make An Offer! Offwhite pages G+ $10 Make An Offer! Offwhite/White pages CGC 9.6 NM+ $175 Make An Offer! White pages CGC 9.6 NM+ $175 Make An Offer! Offwhite/white pages NM-/NM $150 Make An Offer! White pages NM-/NM $125 Make An Offer! Offwhite pages F/VF $28 Make An Offer! Offwhite/white pages, subscription crease VG $10 Make An Offer! offwhite pages VF/VF+ $40 Make An Offer! Offwhite pages NM $110 Make An Offer! Offwhite pages NM- $95 Make An Offer! Offwhite pages, rich colors VF/NM $60 Make An Offer! Offwhite pages, small stain lower corner back cover VF+ $55 Make An Offer! White pages NM/NM+ $110 Make An Offer! Offwhite pages VF- $28 Make An Offer! Offwhite/white pages, 1st appearance of Alpha Flight in cameo. CGC 7.5 VF- $100 Make An Offer! Offwhite/white pages F- $13 Make An Offer! Cream/Offwhite pages NM- $75 Make An Offer! Cream/Offwhite pages VF+ $50 Make An Offer! offwhite pages, nickel size stain on bc F $12 Make An Offer! Offwhite pages CGC 9.4 NM $80 Make An Offer! Offwhite/white pages CGC 9.8 NM/M $350 Make An Offer! Offwhite/White pages CGC 9.6 NM+ $110 Make An Offer! COMPLETED COPY stamped on front cover, offwhite pages VF+ $35 Make An Offer! light 1/2 nickel size light stain on bc, offwhite pages, rich colors VF $20 Make An Offer! Offwhite/White pages CGC 9.8 NM/M $185 Make An Offer! Cream/Offwhite pages NM $90 Make An Offer! Offwhite/White pages CGC 9.4 NM $90 Make An Offer! Offwhite pages, rich colors VF+ $34 Make An Offer! Offwhite/White pages CGC 9.6 NM+ $90 Make An Offer! Offwhite/white pages CGC 9.6 NM+ $80 Make An Offer! Offwhite pages CGC 9.4 NM $90 Make An Offer! Offwhite/White pages NM $90 Make An Offer! Offwhite/White pages CGC 9.4 NM $80 Make An Offer! White pages CGC 9.4 NM $75 Make An Offer! Offwhite/white pages NM-/NM $105 Make An Offer! Offwhite/white pages CGC 9.8 NM/M $1,750 Make An Offer! White pages PGX 9.8 NM/M $225 Make An Offer! Offwhite/white pages CGC 9.4 NM $95 Make An Offer! Offwhite pages NM $95 Make An Offer! White pages CGC 9.6 NM+ $450 Make An Offer! Offwhite/white pages, small stain top of back cover F+ $36 Make An Offer! Offwhite/white pages NM- $70 Make An Offer! Offwhite/White pagers NM- $100 Make An Offer! offwhite to white pages CGC 9.2 NM- $50 Make An Offer! Offwhite pages NM $80 Make An Offer! Offwhite/white pages CGC 9.2 NM- $60 Make An Offer! Offwhite/white pages F/VF $19 Make An Offer! Offwhite pages F/VF $19 Make An Offer! Nice copy, offwhite pages NM- $50 Make An Offer! White pages VF/NM $135 Make An Offer! Offwhite/White pages CGC 9.6 NM+ $60 Make An Offer! VF+ $7 Make An Offer! White pages CGC 9.6 NM+ $95 Make An Offer! Offwhite pages F/VF $5 Make An Offer! White pagers, not sure who signed it NM- $12 Make An Offer! Offwhite pages F/VF $4 Make An Offer! White pagers, not sure who signed it VF- $5 Make An Offer! White pages, qualified because signature not verified by CGC CGC 7.0 F/VF $25 Make An Offer! Offwhite pages NM+ $9 Make An Offer! White pages, Cable cover NM $16 Make An Offer! White pages CGC 9.8 NM/M $155 Make An Offer! White pages NM- $28 Make An Offer! White pages NM+ $36 Make An Offer! White pages NM-/NM $10 Make An Offer! Offwhite/White pages CGC 9.8 NM/M $75 Make An Offer! White pagers, not sure who signed it F $3 Make An Offer! Offwhite/white pages F+ $3 Make An Offer! White pages, CGC label comes with the book NM+ $25 Make An Offer! White pagers, 2nd print F $3 Make An Offer! Offwhite/white pages NM-/NM $8 Make An Offer! Offwhite/white pages NM $7 Make An Offer! White pagers VG+ $2 Make An Offer! Offwhite pages NM/NM+ $9 Make An Offer! White pages NM/NM+ $9 Make An Offer! White pages CGC 9.8 NM/M $525 Make An Offer! White pages, sweet copy NM+ $200 Make An Offer! White pages NM+ $200 Make An Offer! White pages CGC 9.2 NM- $175 Make An Offer! Offwhite/white pages, water damaged VG $5 Make An Offer! White pages NM/NM+ $8 Make An Offer! White pagers NM- $20 Make An Offer! White pages NM- $3 Make An Offer! White pages, still bagged NM+ $6 Make An Offer! White pages CGC 8.5 VF+ $25 Make An Offer! White pages CGC 8.0 VF $20 Make An Offer! White pages, qualified because signature not verified by CGC CGC 9.2 NM- $25 Make An Offer! White pages, Hologram cover NM+ $16 Make An Offer! White pages, X-23 cover/appearance, not sure who signed this NM+ $40 Make An Offer! Offwhite/white pages CGC 9.4 NM $325 Make An Offer! Restored CGC 9.0 VF/NM $160 Make An Offer! White cover, offwhite/white pages VF/NM $120 Make An Offer! Offwhite/white pages NM $95 Make An Offer! VF/NM $42 Make An Offer! Original owner collection, offwhite pages VF $5 Make An Offer! Original owner collection, offwhite pages VF- $4 Make An Offer! White pages, light crease through middle of front cover F $3 Make An Offer! Original owner collection, offwhite pages NM- $7 Make An Offer! Original owner collection, offwhite pages VF+ $6 Make An Offer! Offwhite pages NM/NM+ $7 Make An Offer! Original owner collection, white pages NM $5 Make An Offer! White pages, minor early appearance of Gambit NM+ $50 Make An Offer! Original owner collection, white pages, minor early appearance of Gambit VF/NM $25 Make An Offer! White pages, 3 spots on front cover otherwise high grade F+ $12 Make An Offer! White pages, Magazine NM- $10 Make An Offer! Cream/offwhite pages G $60 Make An Offer!